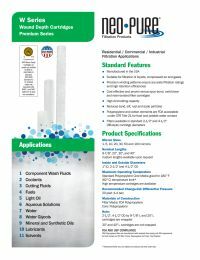 The Neo-Pure WNC-25200-20 20" Natural Cotton string wound 20 micron filters are a cost-effective filtration solution ideal for residential, commercial, and industrial applications. These cartridges are manufactured in USA from materials which are listed for food contact applications in Title 21 of the U.S. Code of Federal Regulations which ensures high reduction of sand, silt, rust, dirt, and scale particles. This NSF filter delivers high quality filtration for many applications such as SDI, Reverse Osmosis, and CDI.